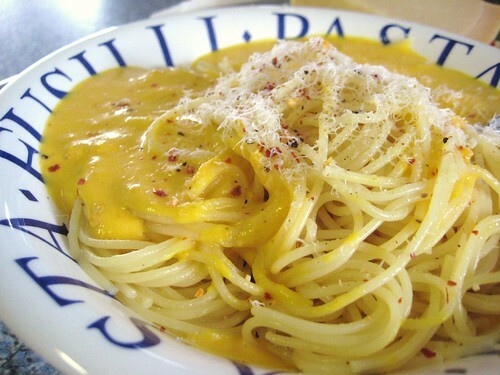 Funny enough, I saw several blogs simultaneously posting recipes involving pasta and pumpkin. Exactly at the same time I was also craving this combination and concocted my own sauce which includes pumpkin of course, cream, parmesan cheese and a splash of broth/pasta water. Some other more refined variations of the sauce I used to make came with an extra of white wine, and a good match with that sauce is also rosemary. Rosemary and Pumpkin = awesome. Suddenly we have a golden October in Germany, well at least 2 days of it, luckily on the weekend, and what a perfect opportunity for driving to the Pfalz and have some fresh new wine and rustic meals. In 2 days I’m off for the big apple, and even though there are so many different kinds of restaurants in the city, I guess I won’t see such dishes anytime soon there.